Baby back ribs prepared in the oven become fall-off-the-bone tender. 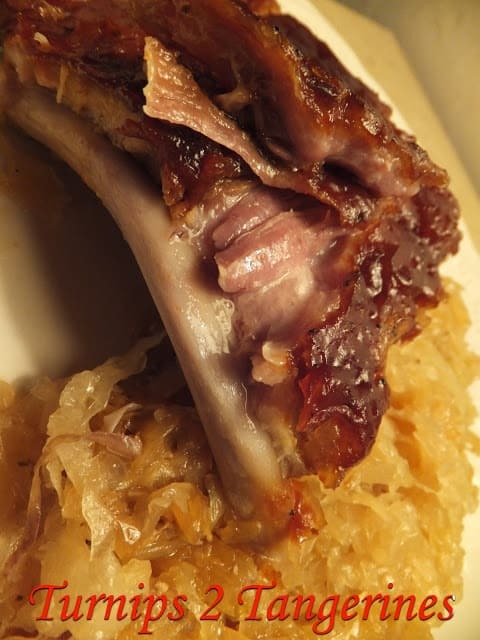 Bake baby back ribs on a bed of sauerkraut and they become tender and delicious! 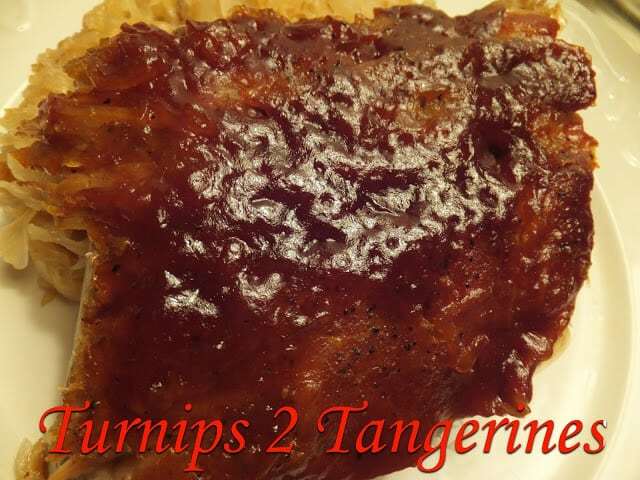 You can use your favorite brand of bottled barbecue sauce or by all means make your own. With all of the fantastic brands of barbecue sauce on grocery store selves, like Sweet Baby Ray’s. Our all thyme favorite brand of barbecue sauce, why would you bother? If there is one thing I love, it’s baby back ribs. I take that back, I love all ribs. Boneless spare ribs, country-style spare ribs or baby back ribs. You name it, we love them. Doesn’t matter whether they’re made with barbecue sauce or without barbecue sauce. But one thing is a necessity, ribs or pork in general has to be prepared with sauerkraut or at the very lest, with kraut on the side. 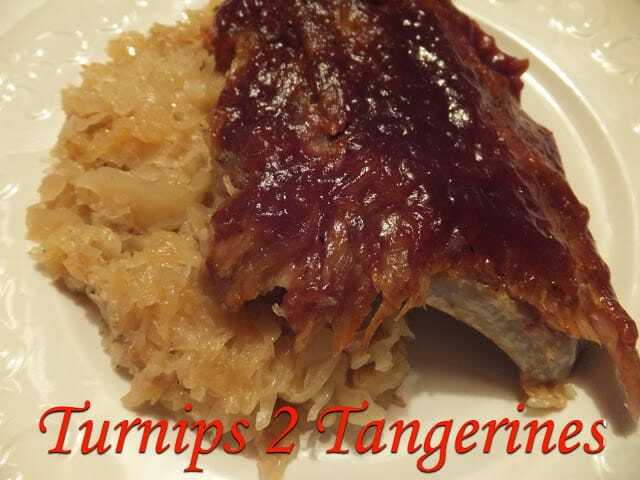 Serve this rib dinner with potato salad and applesauce. Smoky Gouda Cheese Soup, Booze Dogs Smoked Bratwurst Soup and Spicy Cheeseburger Soup. These barbecue ribs are fall-off-the-bone tender. In a large roasting pan, place sliced onions, whole garlic cloves, kraut, apple juice and beer. 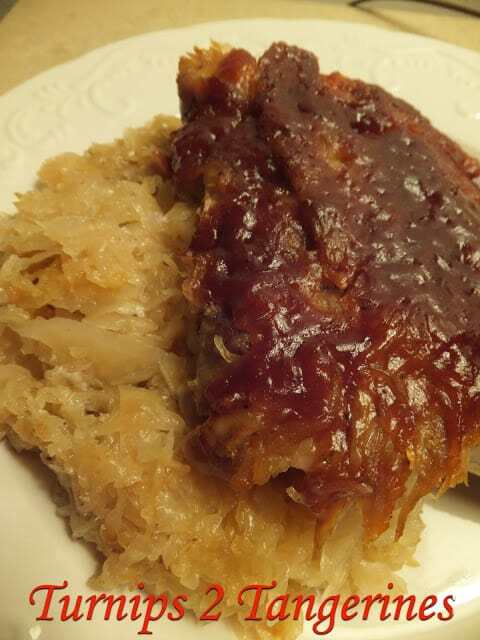 Lay baby back ribs on top of kraut mixture. Sprinkle garlic and herb seasoning over ribs. Cover tightly with foil. Bake at 325º for 2 1/2 hours. Remove pan from oven, remove foil. Drain off half of the liquid in the pan. Pour bottle of barbecue sauce over ribs. Cover tightly with new sheet of foil. Reduce heat to 275 degrees, put back in oven. Bake an additional 1 hour and 30 minutes. Mmmmm baby back ribs! 🙂 It's official. I think I love Man Food! lol! It's all the kind of food I love to eat! Thanks for sharing this at Tasty Tuesday! I've pinned it too!